This same issue of Hugi contains an article by Adok, on approximations. He basically covers Taylor's polynomials: these undoubtedly do the job, and have the advantage that you can simply carry on the computation until you have the required precision, but are not always the best choice when it comes to optimization. This article shows more advanced techniques, but alas it has more dense math and code than Adok's. I believe that nobody ever took the care to put this branch of mathematics into a tutorial. I learnt the things that I have learnt while experimenting with Mathematica at university. Mathematica is a wonderful program created by people who undoubtedly know this stuff; the packages I use to derive these approximations were used to deduce the very same formulas that Mathematica uses to compute transcendental functions. Some more information was deduced by looking at the source code for the GNU C library. The fundamental property of Taylor's polynomials, as Adok has probably explained in his article (which I did not read...), is that the nth-order polynomial for f(x) computed around x0 not only has the same value as f(x) for x=x0, but it also shares the first n-1 derivatives. 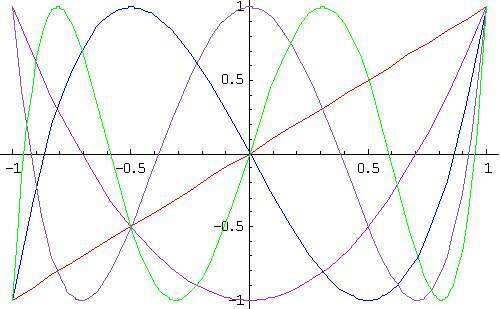 This means that the polynomial "knows" something about how the function behaves near x0 too. 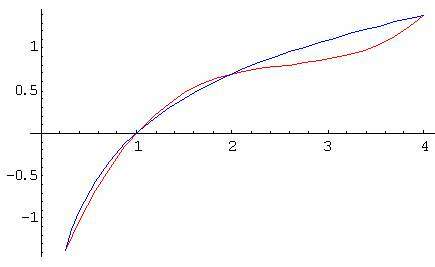 But what if the polynomial's knowledge of f(x), instead of being focused on x0, was spread around n values near x0? What we obtain is known as interpolation: of course we'll lose exact derivatives, because the n coefficients of the polynomial are determined by n constraints (of which n-1 are derivatives for Taylor's polynomials), but we will be able to do a better estimate of the range of x for which the error is sufficiently low. You can see that the formula is 4 x (Pi-x) / Pi^2. In this case it is easy because we have both the roots of the parabola, that is, 0 and Pi. One can however derive a general formula for interpolation, and we'll do that later. How does the interpolation behave (in all the graphics, red is the approximation and blue is the original)? ...decently. The maximum error is 0,05 = 3/4 - Sqrt(2)/2 so you can guess that the interpolation is fine as long as your scanlines are shorter than 20 pixels. 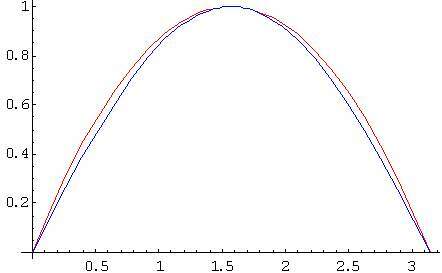 However this approximation has a very nice feature for a sin(x) interpolation -- namely, that sin(Pi/4) = sin(3 Pi/4), which is very important because people expect lines with a 45 degrees inclination to be perfect. (FInterpolate is needed because InterpolatingPolynomial accepts x/y pairs rather than a function to interpolate. Those of you that know LISP might be illuminated if they read Map as Mapcar and the postfix & as Lambda.) 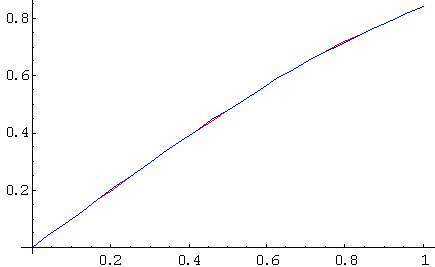 The result is quite poor, as you can see, but Mathematica gave us a hint on how to build the polynomial. We interpolate (f-f(x0))/(x-x0) instead of simply f because we have to "undo" the effect of the linear transformation that constrains P(x0) to be f(x0). Note that good interpolation is harder to do than simply picking a Taylor polynomial. For the sine we were lucky, but it can be difficult to find a good set of interpolation points, and indeed we did not guess it right for the logarithm. One could think of complex algorithms which use more points where the function looks "less like" a polynomial... instead, the answer is quite simple: for every degree n and range in which to interpolate, it turns out that there is a set of x which gives a MINIMAX interpolation. That is, an interpolation whose MAXimum absolute error can be proved to be MINImum. Using the roots is fine if your function has x in the range from -1 to 1, else you'll have to pass them through a linear transformation. This C program does that after having used the recurrence relationships to get Tn(x) and found the roots with Newton's method. The interpolation coefficients in x and y can be computed once and stored beforehand, or precomputed at run time. Newton's method will usually run for less than 10 iterations, so the time to compute the x coefficients will be negligible. Now, we are almost done -- only a few tricks. The first trick is to take advantage of the nature of the function. The trick we had used of interpolating the sine for x>0 only, and use the sin(-x) = -sin(x) identity, still holds when using these techniques. The second is that interpolations are usually better if you use them on small intervals, but you can use three or four different adjacent interpolations. You might know that a spline is simply many adjacent cubic interpolations, with a different cubic used between each pair of points (you have 4 constraints from a cubic: Bezier splines use them for the first and second derivatives at each of the endpoints, Catmull splines use them for the y and the first derivative). The third is that rational approximations are usually much more powerful and precise than simple polynomials. Indeed there is an extension to Taylor polynomials, called Pad� approximations, that is designed to have the same first n derivatives as the Taylor polynomial but much better convergence; I don't know exactly the details, but some cooked Pad� approximations can be found if you search on comp.lang.asm.x86 with groups.google.com (the post is mine). 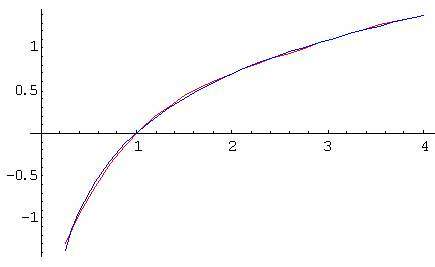 Is there a minimax approximation using rational functions? Well, Mathematica has it and that's how it computes transcendental functions internally; it is extremely powerful: with 3 multiplies and a divide you can easily obtain four or five digits of precision! The algorithms are very complex, and based on the manual I gather that it uses some kind of hill climbing or genetic algorithm -- maybe I'll write about these as soon as I give the related exam at university... for the moment, if your school has Mathematica installed you can just use their copy, and plug the approximations you find in your code.